The Dictator tells the story of the egotistical dictator of Waadeya, Aladeen (Cohen), who executes everyone who disagrees with him. It is not long before he is called to America to address the UN over concerns about his developing nuclear weapons programme. While there, he is embroiled in a plot to overthrow him, and bring democracy to Waadeya, instigated by his supposedly faithful relative and advisor Tamir (Ben Kingsley). To prevent the signing of the fatal treaty, Aladeen must befriend the feminist eco-warrior Zoey (Anna Faris) and disguise his prejudices along the way, a feat that is far easier said than done. It's no secret that I've never been as swept away by Sacha Baron Cohen's films as a lot of other people. It took me ages to see Borat, and when I did finally see it, I could anticipate many of the jokes, given that people at school had quoted it until they were blue in the face. Having said that, I found Brüno extremely funny, particularly the scene involving the child models, and their awful parents. 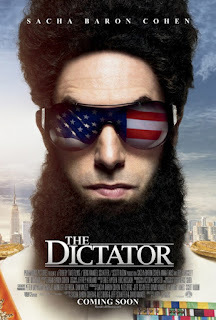 I also greatly enjoyed the lead up to The Dictator in terms of marketing, including the Supreme Leader Aladeen's appearance at the Oscars where he scattered the ashes of Kim Jong Il onto the Red Carpet, and his appearance on The Daily Show. These unscripted appearances by Aladeen succeed where the film does not, because they make use of Cohen's impressive ability to stay in character and make a mockery of anyone and everyone. I'll start by saying this is not a bad film. Arguably, some of the humour was spoiled by the trailers, and much of the script is built on a 'set up' and 'punchline' model. This isn't to say the jokes aren't funny, but more that the delivery feels a little forced. However, scenes between Cohen and Faris play out well, and the funnier moments (in my opinion) involved Aladeen's overt sexism (sexism is laughable after all). Cohen succeeds in mocking both the backward attitude of these infamous dictators, and the West's illusion of modern democracy. Don't get me wrong, this is an unashamedly a silly comedy, but what sets it apart from other silly comedies is its satirical edge. No, it's not a masterpiece, but it still makes for an enjoyable viewing experience. For a proper film review of this, and not my plebeian ramblings, visit Filmophilia.